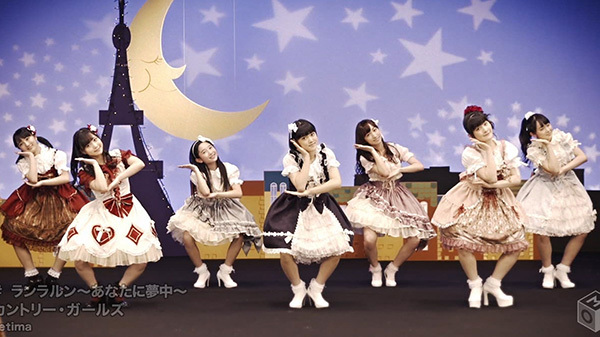 Diving into another part of Country Girls’ new triple-A side, “Ran Ra Run ~Anata ni Muchuu~” continues on with the retro feel. It’s not quite as memorable as “Boogie Woogie Love”, but it’s still pretty cute. This video is a lot simpler than the one we previously had a look at. The colors are dull across the board and feel, for better or worse, typical for a J-Pop PV. The outfits are also a bit less standout, inspired by early 20th century western dresses and, surprise surprise, fairly dull in color. The PV features a few low energy dance shots, but thankfully these are between quite a few really cute shots of the girls vying for the attention of their suit and top hat-attired counterparts. The whole thing doesn’t have a lot of energy and there really isn’t a ton to write about, but it’s cute. It accomplishes what they were going for, I think. This song feels like a cousin of “Boogie Woogie Love”. The instrumentals follow a formula that reminds me of 60’s doo-wop. It’s pleasant enough to listen to, but not very energetic and nothing to really write home about. The video is the easy winner here. There’s nothing wrong with the song, it’s just kind of limited in its appeal. Country Girls’ third single drops March 9th.